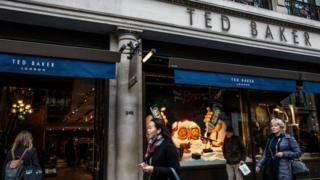 Shares in Ted Baker have tumbled over 12% after the fashion chain warned profits would be lower-than-expected. The retailer blamed currency movements, product costs and a writedown on unsold stock for the disappointment. It said full-year profit for the year ending on 26 January would be around £63m, compared to forecasts of £73.8m. The firm's shares were hit late last year amid a hugging controversy after staff alleged they suffered unwanted embraces from founder Ray Kelvin. The company has appointed a law firm to conduct an independent external investigation into the hugging allegations, which it disputes. Mr Kelvin announced in December that he would take a voluntary leave of absence. Investors had feared that negative publicity surrounding harassment allegations against Mr Kelvin would affect the brand's popularity. But the retailer's Christmas trading update last month showed a 12.2% rise in sales. In December, an online petition launched by employees accused 62-year-old Mr Kelvin of inappropriate comments and behaviour, including "forced hugging". The petition, on the workplace website Organise, said that more than 200 Ted Baker staff were finally breaking their silence about at least "50 recorded incidents of harassment" at the fashion group. Staff claimed that as well as engaging them in unwelcome embraces, the brand's founder had asked young female members of staff to sit on his knee, cuddle him, or let him massage their ears. At the time, Mr Kelvin said that it was "only right" Ted Baker's committee and board should investigate. "I love this company and I care deeply for all my colleagues. It's for that reason that I have decided to take a temporary leave of absence," he said.